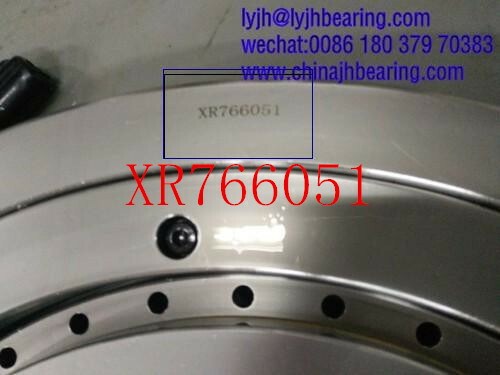 We JinHang Precision bearing offer crossed tapered roller bearing XR766051,the dimension 457.2x609.6x63.5mm,with P4 high accuracy. The structure with outer ring whole unit and the two half of the inner ring. The bearing XR766051 code equal to SKF 615894A,NACHI Bearing 0457XRN060,URB Bearing XD.10.0457P5,PSL Bearing 912308A,If you need the assembly drawing,we can offer to you. 2.precision crossed tapered roller bearings are intended for high precision arrangements with combined axial-radial loads. A design of the bearing comprises an outer ring,split inner ring and tapered rollers in crossed position. The rollers are separated by plastic spacers. The concept of the bearing with tapered rollers in an X arrangement positioned in turns towards raceways enables to accommodate axial loads in both directions,radial loads as well as tilting moments. Crossed tapered roller bearing contains two sets of races and rollers brought together at high angles with alternate rollers facing in opposite directions. The height of cross section is similar to single-row bearing for conserving space and saving bearing housing material.And the steep-angele,tapered geometry results in a total effective bearing spread much greater than the width of the bearing itself. It is able to withstand high overturning moments,and it optimal for machine tolls,including vertical boring,grinding machines,precision circular dividing table,gear hobbing machine,turret and industrial robots. Package: Inside package: plastic film + kraft paper + blue tape; Outside package: standard export free-fumigation wooden case.